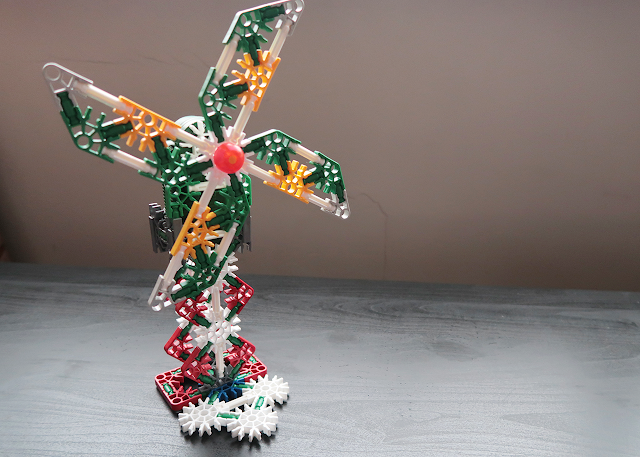 K’Nex is a brilliant construction toy that uses rods, connectors, and wheels to make models. 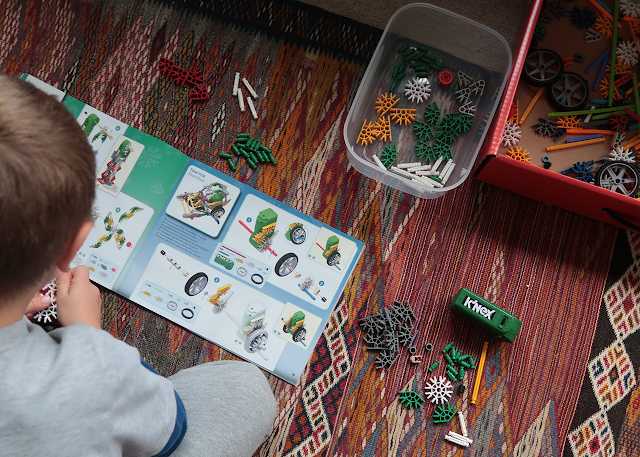 K’Nex offers a different building experience from LEGO and by design, you can build move and spin. 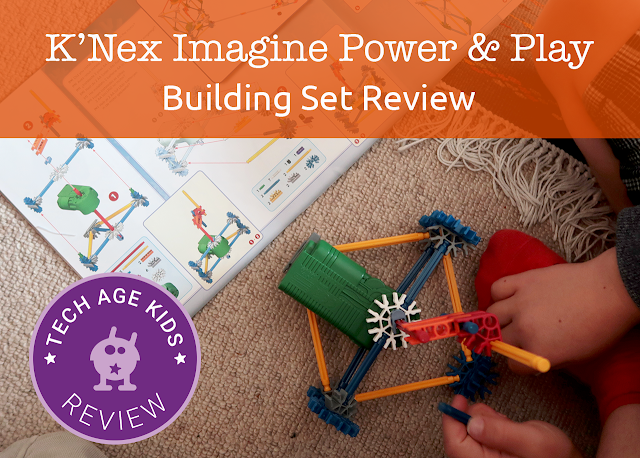 The K’Nex Imagine Power and Play Building set comes with a motor to add motorised motion to models. 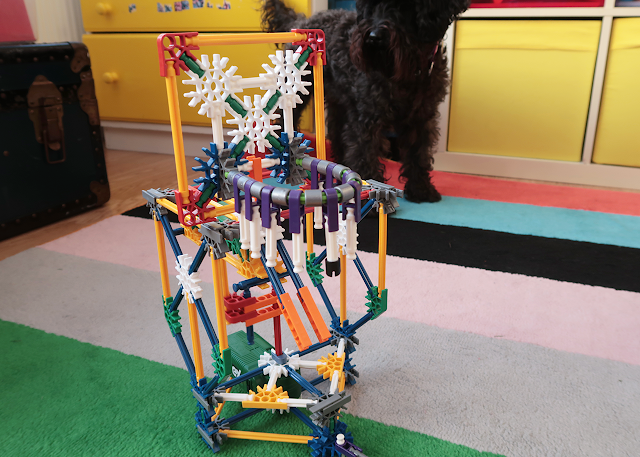 I reviewed the set with my two boys aged 7 and 9 (they’ve not built much with K’Nex before getting this set). Disclaimer: K’Nex sent us an Imagine Power and Play Motorised Building Set to review. Our views are always our own. The set comes in a big box with 529 K’Nex parts and a battery-powered motor that needs 2 AA batteries (not included). The box is a suitcase-style, so you could use it for storage, but it was a bit shallow to store some of our built models. If you use the box for storage, you may want to seal the seams of the cardboard with some duct tape so that tiny pieces don’t get lost. We used a clear plastic IKEA box to store our K’Nex. K’Nex is a unique building experience and if you’ve not used it before, we recommend getting used to building the rod, connectors, and wheels using a small model. The first couple pages in the building instructions have models that don’t use the motor to get used to building with K’Nex. The boys built the scorpion and then played with it for a while before moving on to building other models. The K’Nex system is fantastic as all the pieces are colour coded and they are the same across sets. Which means you can mix sets and still easily find pieces for models. I found the instructions less clear than LEGO instructions, but my kids seem to have no problem and quickly moved on to harder models, despite having little experience building with K’Nex. Often when the kids build models, I become the 'piece finder' and then they like to group the pieces to help make the build go faster! The instructions booklet that comes with the set, contains 8 models that use the motor. You can download PDF instructions for more models from https://www.knex.com/instructions and type 23012 for this specific set. My 7-year-old was determined to build the Basketball Game model. He spent a couple afternoons after school carefully following the instructions and building the model, completely independently. I actually was really impressed, but the pieces aren’t necessarily very easy to push together. The Basketball Game is a really fun model and the kids spent the next couple weeks playing the game. You have to shoot a ball through an ever moving basketball hoop! Unfortunately, if you want to make another model, you need to break up the current one. Reluctantly the boys broke up the Basketball game and then built the fan. Both models offered plenty of opportunities to explore how the motor and construction worked together to create the motion. It’s a fantastic set for developing engineering skills. You’ll need a small screwdriver to insert or change the batteries in the motor. You can use standard or rechargeable batteries (don’t mix them though), however, K’Nex doesn’t recommend rechargeable batteries. The batteries run out fairly quickly, we needed a new set for the fan model, although the boys did play a while with the Basketball game. In our case, I wish there was another motor in the kit. My boys tend to work on projects together. One motor is OK when it’s a single model they’re building. When they are engaged in free play, each wanted a motor to make their own creations. Thankfully with K’Nex you can buy additional motors separately. K’Nex Education - Motor Pack includes 2 motors. The Power and Play Building Set from the K’Nex Imagine ranges offers a lot of value for the price. There’s plenty of guided models to build, but the building system provides the opportunity for free play and designing your own creations. It’s fairly easy to build but some bits can be hard to push in or take apart. My 7-year-old commented on it sometimes hurting his fingers. I’m not sure if with time and use the piece will become less stiff. 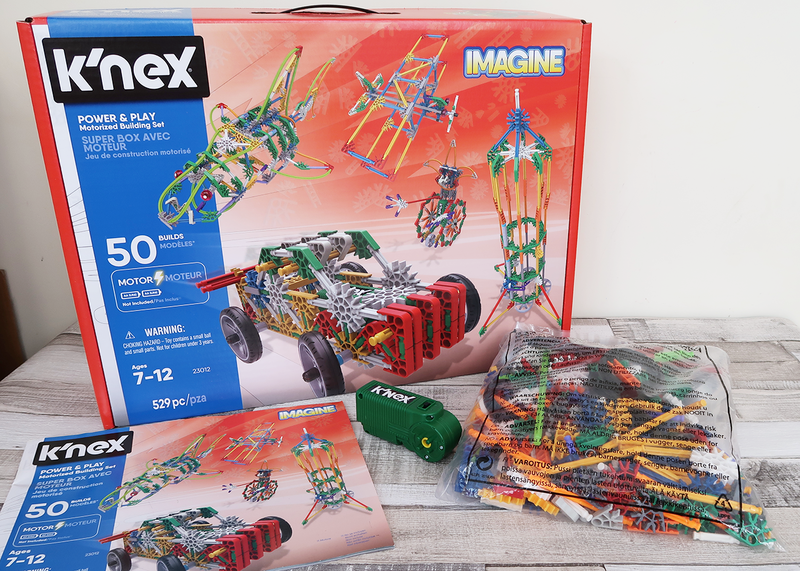 K’Nex recommends this kit for ages 7 - 12, and that seems about right, although you probably want to invest in K’Nex at the lower age range to get the best value and longevity from the product. You may need to invest in a stock of batteries if the kids really enjoy using the motor. It does seem to use a lot of power. Plus getting more motors for the kit isn’t a bad idea if it’s a kit that will be shared in a family. There are lots of sets in the Imagine range and you can build up your collection over time. Perhaps with more pieces, kids don’t have to break up their favourite models to build other ones!